The show horse world was saddened by the loss of one of its most courageous and unique characters today, August 2, when Patty Milligan lost a long and hard-fought battle with cancer. It was one of the few battles she didn’t win. She was 59 years old. Opening Milligan Stables with her husband, Hall of Famer Dale Milligan, more than 40 years ago, Patty has long been the face of the Southwest Circuit. 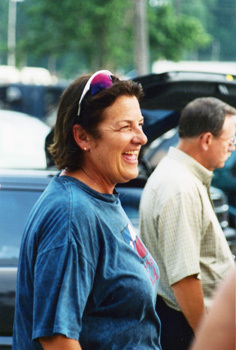 From starting riders at the lesson level, to breeding and developing young world’s champions to putting world class amateur and junior exhibitor combinations together, Patty had done it all at and at all levels. Adversity was a mere curve in the road for Patty as she had the most positive attitude of anyone you’ve ever met. She also danced to a different beat living life her way, always to the fullest. "She put up the bravest fight you’ve ever seen," said longtime friend Nancy Braesicke referring to her battle with cancer. Her daughter Angela Milligan and her mother, Ester Verdin, survive Patty. A viewing will be held on Thursday August 5, at 11:15 AM at Sparkman-Hillcrest Funeral Home, 7405 W Northwest Hwy, Dallas, TX 75225. Services will be held at noon on Thursday, and a reception will follow at the Milligan home on the Milligan Stables property, 3116 E Parker Rd, Plano, TX 75074. In lieu of flowers, donations can be made to the Texas Scottish Rite Hospital in Memory of Patty Milligan, Attn: Development Dept, 2222 Welborn St, Dallas, TX 75219. Donations may be made by phone at (214) 559-7650.